Samsung latest adverts and marketing campaigns have been having a dig at Apple, their latest one is somewhat strange as Samsung decided to stage a fake protest outside an Apple Store in Australia. 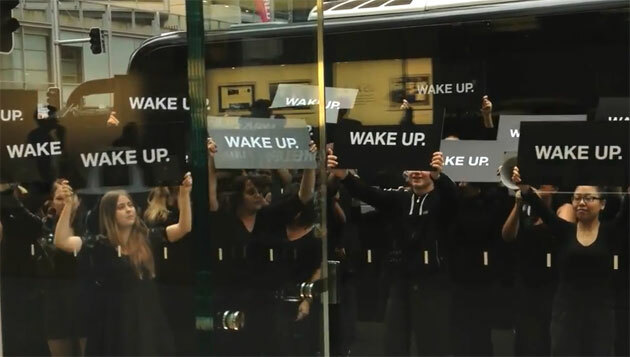 Samsung sent a bus load of protesters to an Apple Store in Australia, and then had the protesters chant ‘Wake Up’ outside the store while brandishing some ‘Wake Up signs’. Obviously this is another attempt by Samsung to have a dig at Apple, and they have also created a website called Wake Up Australia, that has a countdown to the launch of the new Samsung Galaxy S III. It looks like it wasn’t Samsung behind the campaign, instead RIM has claimed responsibility for it full details here.